We are continuing with our series on reducing our plastic use through several small steps – simple recommendations that we can all implement at home and while out and about. Small steps that will hopefully change our mindsets about single plastic use but also significantly reduce our family plastic footprint over time. These small steps would make a fun family project this summer… You could document how much less recycling/rubbish you are generating on a weekly basis! If you do, send over your pictures for us to post and help encourage other families to do the same! Most disposable coffee cups end up in landfills, either because they are not being recycled or, more frustratingly, because they cannot be recycled. Although disposable coffee cups are largely made of paper, to be waterproof and able to contain liquid they are lined with a layer of plastic polyethylene. This means that they cannot be recycled in standard recycling plants and instead must be taken to special facilities. The UK, for example, only has three such places in the entire country! 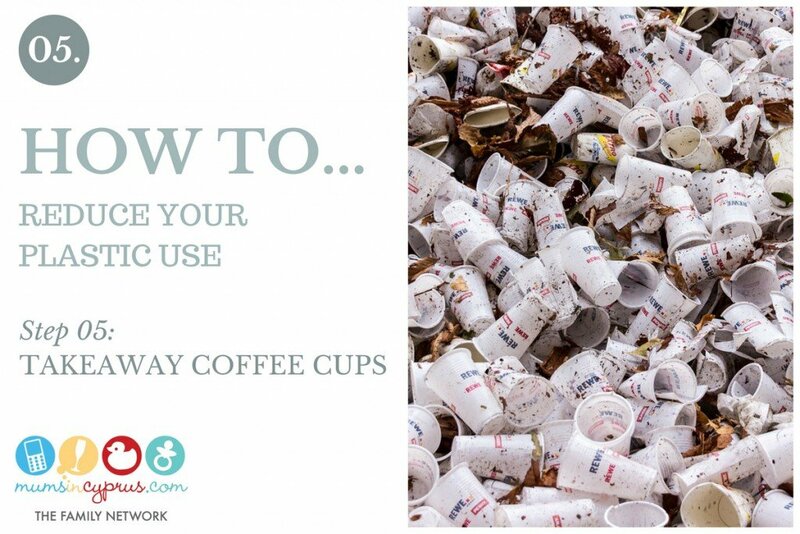 This means that less than 1% of the disposable coffee cups used in the UK are being recycled. Considering that their population gets through an estimated 2.5 billion cups a year, that’s a hefty number of cups ending up in the landfills that will be sticking around for quite some time! Clear plastic coffee cups like these used for smoothies, juices and frappes are commonly used here, especially in the summer months. At least they can be more easily recycled. Many of the smaller and independent coffee stores and cafes are now choosing to use the more expensive but far more environmentally ethical coffee cups that can more easily be recycled or composted. Reusable coffee cups have been around for some time and are now widely accepted in most coffee houses. In fact, most larger coffee chains sell their own branded versions. It’s a small change to make to your daily routine but once you get in to the habit of bringing your own cup, you will realise what an easy change it was to make. You can also consider taking an extra 5 minutes to slow down, rest and dine in. Or some mornings, make your own coffee at home and bring it with you and you’ll be saving money as well as the planet! How can we campaign for less packaging from shops that we buy from here and online? For a start, we can vote with our feet and our wallets! Let’s start a revolution and take back the control of what we buy and consume! Please use these social media tags when sharing posts about reducing plastic use and help spread the word that change is needed. MiC Exclusive: Babycup First Cups – the little cup that’s kind to baby teeth!